Instead of spending reform and policies to promote economic growth, Illinois House Speaker Mike Madigan proposes the same high-taxing, big-spending plans that got Illinois into its current fiscal mess. Illinois House of Representatives Speaker Mike Madigan has spent the last year selling Illinoisans on a tax-hike Band-Aid for a gaping financial wound. It’s the same failed approach former Gov. Pat Quinn took – evidently, Democratic leaders have failed to learn from the state’s past mistakes. Madigan has focused on an additional tax hike even though a recent study from the Tax Foundation shows that Illinois’ 2011 income-tax hike saddled Illinoisans with the fifth-highest tax burden among the 50 states, and the second-highest tax burden in the Midwest. 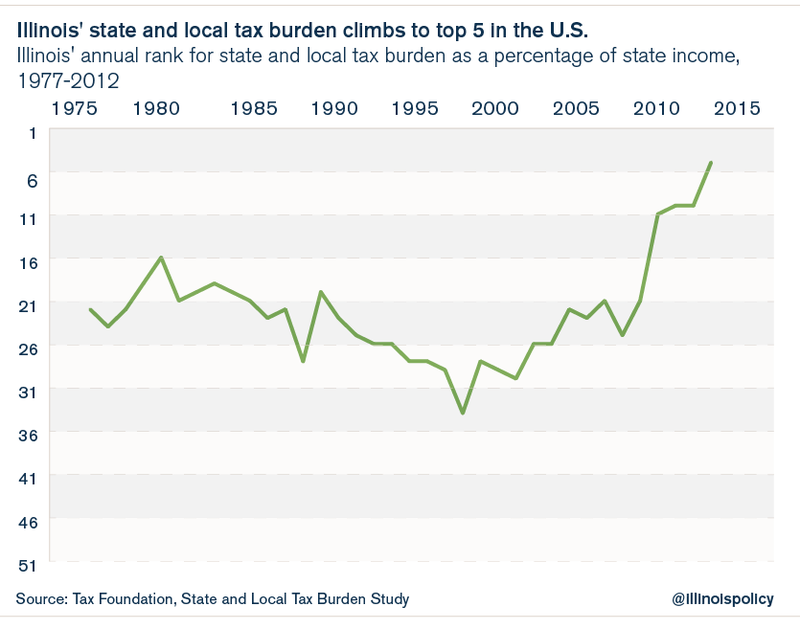 Even worse, Madigan’s idea of restoring the 2011 income-tax rates would likely impose on Illinoisans the highest tax burden in the Midwest and fourth-highest in the country. The major drivers of Illinois’ budget problems are an underperforming economy, massive taxpayer out-migration, and unaffordable spending promises. But to hear Madigan talk about it, Illinois has gone without a state budget for seven months because Illinoisans don’t pay enough taxes. And the speaker’s fix is all too familiar in Illinois: another big tax hike without any economic or spending reforms. According to Madigan, the conversation about Illinois’ income tax should begin at the 5 percent rate that Illinoisans paid from 2011 through 2014. Madigan’s budget necessitates that the average Illinois household pay an additional $800 per year in income taxes. 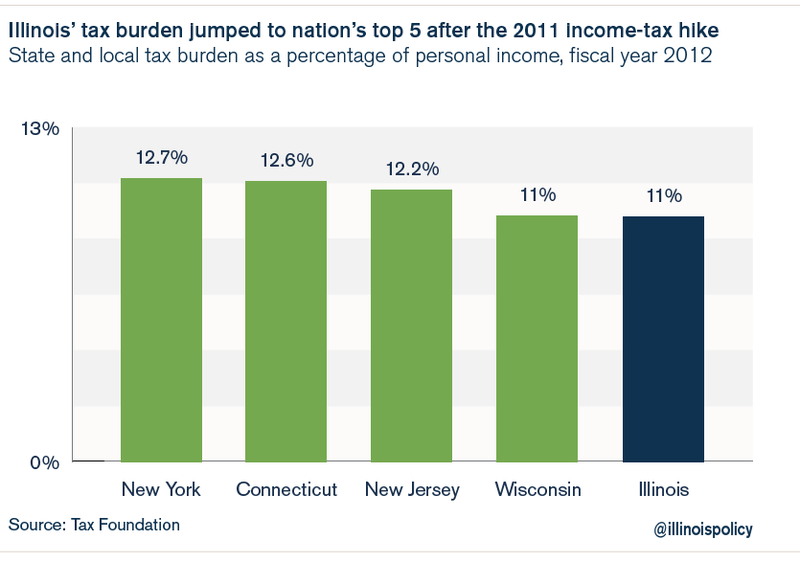 As of fiscal year 2012, Illinois’ tax burden was the second-highest in the Midwest, just behind Wisconsin, and the fifth-highest in the country, behind New York, Connecticut, New Jersey and Wisconsin. But that was before Wisconsin Gov. Scott Walker enacted a series of tax cuts in the Badger State. Since fiscal year 2012, Wisconsin has cut more than $1 billion per year in state and local taxes. In January 2015, Illinois’ tax relief came in the form of a partial sunsetting of the rates imposed by the 2011 income-tax hike: to 3.75 percent from 5 percent. This is the very tax hike Madigan wants to reinstate. Local governments in Illinois have been busy raising taxes, too. Take Chicago and Cook County, for example. In 2015 alone, the tax bill for the average Chicago household went up by $1,100 per year just from city and county tax hikes. And after all that, Chicago aldermen are discussing the possibility of another property-tax hike of a few hundred million dollars per year in 2016. A state income-tax hike on top of these added local tax increases would create a dramatically higher overall tax burden. Years of reckless policies have put Illinois in the nation’s biggest fiscal hole, and it’s time politicians stopped digging the state further into debt. Illinois needs spending reform to correct the policy mistakes that have put Illinois in such dire straits. Illinois’ tax-burden ranking was as low as No. 34 in 1998, but it shot up to No. 5 as of fiscal year 2012. An income-tax hike would make Illinois the most heavily tax-burdened state in the Midwest and among the top four most tax-burdened states in the U.S.